I'm playing a Shemboid set at All Saints Community Centre, Hoole, Chester on Saturday 30th September 2017. I will be a support for Vibravoid, Earthling Society and others. I'm looking forward to it. Come along and support the ever growing Chester music scene. I went down there in February to see it, and I wasn’t disappointed. The work on show represented a wide variety of styles, techniques and periods in his life and career. He was one of the most original and creative artists of the twentieth century and, for me, as important as Picasso and Warhol. He had a profound influence on later generations of artists, and still has. He did not fit into , or follow, any other genre or movement, and showed strong ethics in his social and political conscience. Rauschenberg covered a lot of ground in his life and career, and practically all his interests were represented at the Tate. He experimented with images from magazines by applying lighter fluid, and then rubbing the back of the image onto his canvas, or whatever he was working on. The images were generally small, as magazine photos are, and he was limited to the exact size of the given printed image, so he could not enlarge them by this method. He later took to working with silkscreens (at the same time as Warhol) and he had a large collection of his own stock screens, which he would use again and again in different arrangements. The finished prints were generally large and featured many iconic images (JFK, Moon landings, old masters, cityscapes), all juxtaposed in various formations and compositions. He used to walk around his block in 1950’s New York City and pick up discarded objects, and take them back to his studio to make art out of them, which became known as his combines. These were part sculpture, assemblage and painting. His famous ‘Bed’ was on show at this exhibition, as was the stuffed goat with the tyre round its middle. He wasn't taken seriously as an artist for some time, and many thought he was just taking the piss. He was first accepted and given the credit he deserved in the 1960’s, due to his screen prints. He won an award for them, and he then promptly gave instruction for his stock of screens to be destroyed. He was never a man to stay standing still, and always looked to move into the next groundbreaking direction. 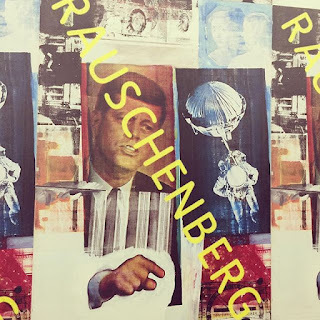 Rauschenberg was also an avid photographer and he made many photo montages, treating them with ink or paint, creating a further exciting mix of media. He also worked closely with John Cage and the dancer, Merce Cunningham. With them, he created theatre set designs, films, and even choreography. He was himself keen on dancing, and appeared in some of his own choreographed shows and films. His later work was also represented. Some of these were vast canvases, which included printmaking and mixed media. By the time I got to these, I felt like I’d already seen the best of his work, and I was feeling quite full up with ideas and inspiration to take to my own work. It took over two hours to get round it all, and I felt like I’d seen some of the greatest art of the twentieth century. 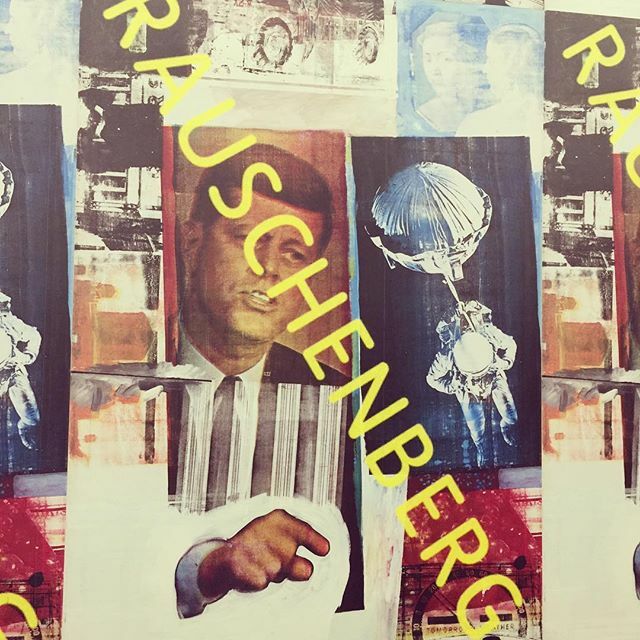 Here's to the great Robert Rauschenberg! Also, I think hats off to Tate Modern for being able to acquire these important and iconic works for this exhibition, many of which had travelled a long way, and rarely seen in the UK. Truly world class!